This winery is the definition of stop-and-sip wine tasting. 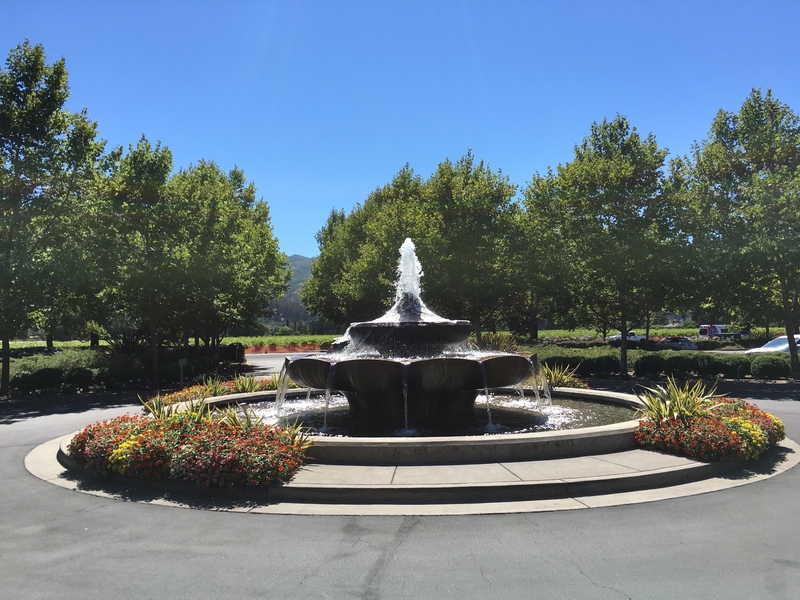 It’s located right on Highway 29 in Saint Helena with a can’t-miss fountain out front. 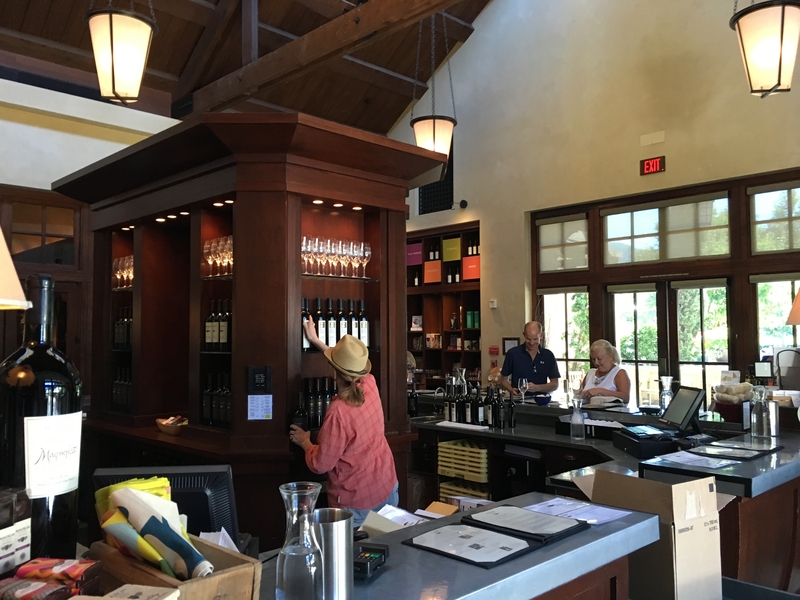 The tasting room is a bar and wine shop combination and features wine lingo as part of its decor. Terms like “terrior”, “bouquet”, and “body” decorate the perimeter. Perhaps these are here to help patrons learn to “speak wine”? This winery is designed for the tourist off the street, with stroller and camera strap in tow. Expect to assertively position yourself at the bar on busy days, right next to the oven mitts and ATM. Catering to tourists isn’t all bad though. Those who are new to wine tasting can feel free to ask questions about winemaking, and even the tasting protocol itself, without hesitation. Everyone is welcome here. We chose to sample the Reserve Tasting menu which included a variety of wines. Another nod to tourists was the availability of a tasting menu featuring only white wines. Our menu began with a 2013 Cuvée Sauvage Chardonnay. It was smooth and creamy like most Chardonnays, with a baked apple bouquet. The 2013 Reserve Merlot conveyed spicy cedar and tasted more like a cab than a merlot. 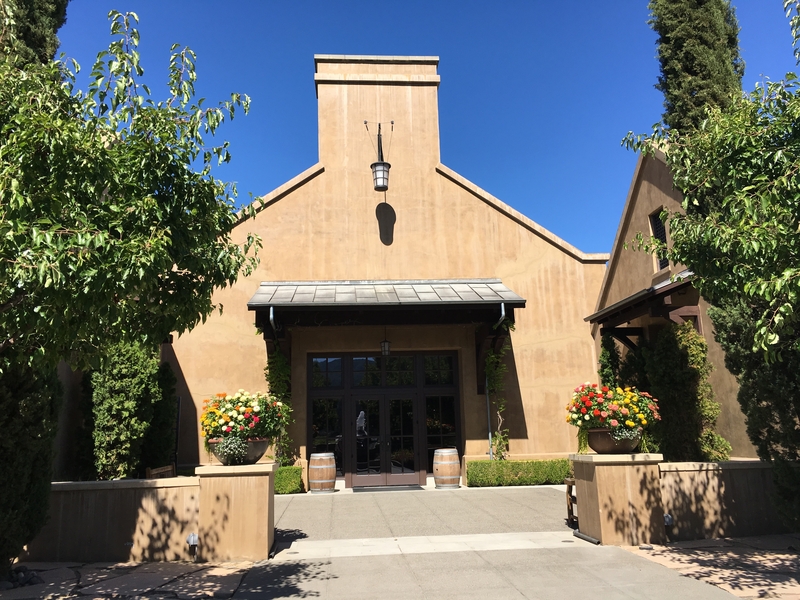 The 2012 Oakville Cabernet Sauvignon had notes of cherry vanilla and the 2012 Clos Reserve revealed its Malbec underpinnings and a soft finish. The palatal surprise was the 2012 Winemaker’s Reserve Petite Verdot. The oak was expected but the cutting white pepper finish was an eye-opener. Tip: Let your wine attendant know what type of tasting experience you’re looking for, otherwise you may get the same spiel that every tourist hears day in and day out.